You are here: Home / 1 tonne snake! One of the worst films of all time ‘Anaconda’ starring J-Lo depicted a huge Anaconda in the deep rainforests of South America. The snake in question seemed to get bigger as the movie went on. It now seems that a creature this size did once exist. A team from Canada have used known mathematical formulas based on snakes of today to estimate the snakes size and weight from its fossilized remains. At 13 metres long and weighing over a tonne it would have been an impressive animal. Thought to live much of its life in the water it may well have fed on very large fish and even crocodiles! 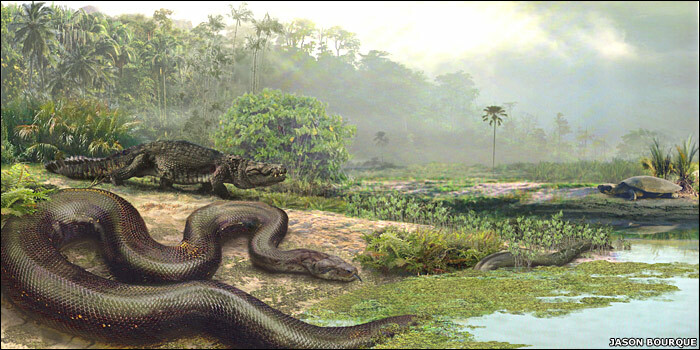 The reason for the snake’s enormous size is thought to be contributed to the climate at the time.